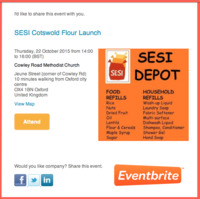 Please come and join me at SESI Cotswolds Organic Flour launch celebration. Where there will be free soup, bread and dips. Superb talks by our guests from FWP Matthews and local authors and bloggers. Free, family friendly and open to everyone. Click Here to book tickets. This entry was posted in Blog posts on October 5, 2015 by carolinementzer.